Founded in 1863 at the request of King Kamehameha IV and Queen Emma, ‘Iolani School is situated on a 25-acre campus in Honolulu, Hawaii and serves more than 510 students in kindergarten through sixth grade and more than 1,370 students in seventh through twelfth grade for a total of approximately 1,880 students. A culturally diverse, co-educational, college preparatory day school with approximately 306 full-time faculty, ‘Iolani is rated among the best independent schools in the country for its academic, arts and athletics programs. The philosophy of One Team originated with the founder of the school’s athletic department and now influences all aspects of the school by emphasizing collaboration, teamwork, strong moral character, and a sense of community. In 2012, Dr. Timothy R. Cottrell became ‘Iolani’s 53rd Head of School and in 2013 the school opened the four-story, 40,000 square foot Sullivan Center for Innovation and Leadership which offers collaborative learning spaces where students learn to be effective leaders through courses emphasizing empathy, interpersonal communication, and real-world problem solving. ‘Iolani graduates continue on to some of the best colleges in the country and around the world. The school is committed to its tradition of excellence, while embracing the future and preparing students to succeed in a rapidly changing world. Engineering teacher Gilson Kilhour works on the the Ala Wai Catamaran, which is a project coming out of the Wet Lab and Fabrication Lab. The catamaran has a drone to take water samples, is built with a GPS and is remote controlled. Students study the water samples to learn more about ecology. 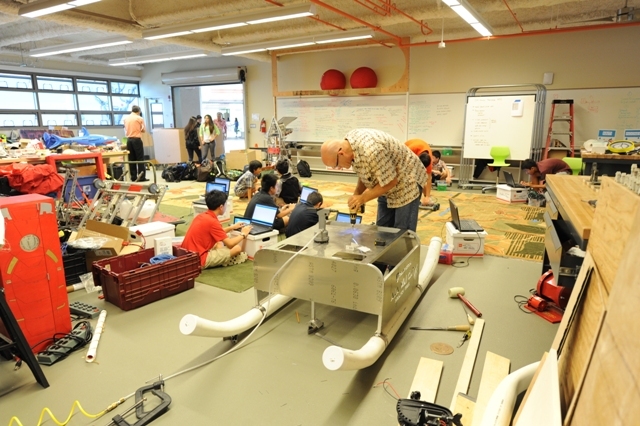 ‘Iolani School’s Upper School fabrication lab is a 4,200 sq ft space dedicated to design & fabrication. The space includes to a 2,000 sq ft Robotics space and houses 3D printers, laser cutters, a waterjet cutter and CNC mills that support classes like Make It 101, Electronics, Robotics and Design & Fabrication. Computers equipped with CAD software line the perimeter of the space while mobile SMART boards and whiteboards support flexible learning. Power cords hang from the ceiling and retract when not in use. Tables and chairs are on wheels as the space frequently adapts to support classes, clubs and individual projects. Opened in the Fall of 2014, the Lower School fabrication lab is equipped with an Epilog Mini 60 Watt 12×24 inch Laser Cutter, a MakerBot Digitizer, a Sense Hand-held 3D scanner, and Silhouette Cameo Vinyl cutter. We also have 4 Printrbot Simple Metal 3D printers and a HP LaserJet 500 Color Printer/Scanner/Fax/Copier. In addition, we have 10 MaKeyMaKeys sets, 8 Sparkfun RedBoards, 10 Mac Book Airs (which we use to run the machines…except for the Laser Cutter which is using a Dell Optiplex 9020) and a littleBits Pro Library. The room also contains a SMART Board 800, with a NEC projector, all mounted on an iRover2 cart, 10 moveable and 6 stationary work tables. The Lower School fabrication lab is accessible to all 550+ kindergarten through 6th grade students and their teachers. The lab is staffed with a S.T.E.M. teacher that works with individual students, classes and teachers on designing and creating projects specific to individual interests and curriculum areas. The iDepartment offers classes in Robotics 1 and 2, Electronics and Embedded Design, Design and Fabrication, and Make It 101. These project-based courses serve to teach design and project-management skills related to the individual topics. Members of the department also work with faculty of other disciplines such as English, History and Science, to bring to fruition projects related their courses. Students have also frequently requested assistance with their individual project plans from other courses. iDepartment faculty, in conjunction with other faculty, have also design and produced teaching tools and manipulatives to be in curricular settings. Extra-curricular programs such as robotics (FTC and FRC) and Science Olympiad teams use the space and facilities outside of class hours. Other school groups have requested assistance from production of simple name tags and signs to creation of display posters to design of electronics for use in scientific experiments. One student group #iolanihackers has used the space and facilities to enliven areas of campus. The space has also supported students in pursuits of their own personal interests: creating jewelry for a gift or a keepsake box for a Mother’s Day gift or dazzling light display because it is “cool.” Often these interests have brought students in to discuss the viability of their idea and plan its execution with iDepartment faculty. The space also serves to support the needs of school offices such as small gifts for admission events and donor receptions and design and production of plaques and awards. As the number of students who have experienced use and support available in the space grows, the overall demand and resultant creativity of the space will likewise grow. The space is open during and after school hours and usually on weekends as well and deliberately encourages students and faculty to transform their ideas to reality. One of the exciting aspects of the space is its ability to enable students to take what they have learned to another level. Often, if given the opportunity, students will soars beyond the expectation of even their teacher. In the middle school History of the Ancient World course, students were challenged to create a board game based on one of the civilizations that they studied. In three days students learned 2D design and use of the laser cutter and brought their boards and game tokens to life by using the facilities of the iLab. After reading The Diary of A Young Girl, students transformed their knowledge of Anne Frank and the family’s living conditions to a scale model of the rooms which was their world for two years. Students completed the project by writing of their decisions of furniture, colors, wall hangings that they displayed in their models. Students in an AP Physics class use the space to design and complete projects based on the open-source microcontroller Arduino. Besides use of the soldering stations and the electronic test equipment, students use the laser cutter and 3D printers to give their projects a “finished” appearance. The Lower School lab hopes to offer mini classes to each grade level on a variety of topics specific to working in the lab. Classes will last 2-4 sessions and be age/grade appropriate. iDepartment is currently examining curricular offerings, especially in light of the opening of K-6 FabLab, to provide a continuum of courses and opportunities for all students. With an increasing number of projects and classes requesting time in the space, examination of space utilization must be conducted to provide adequate and safe environment for the multitude of uses and users.